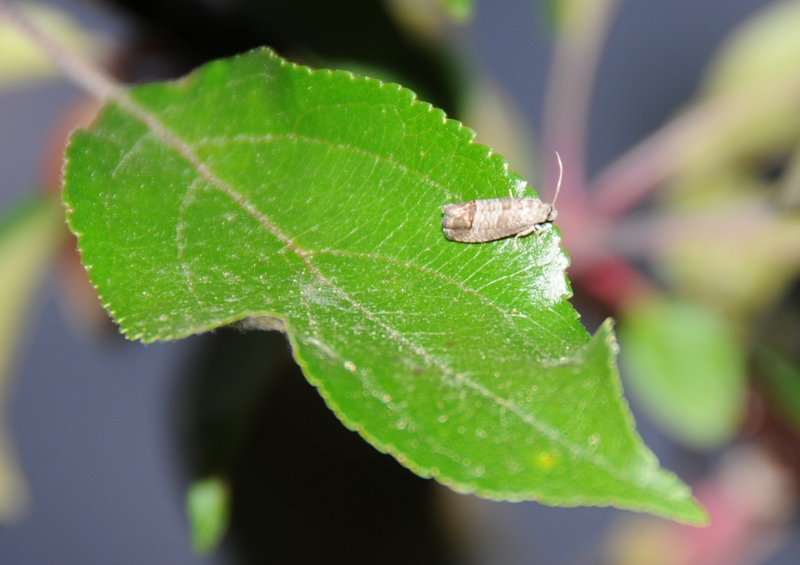 Codling moth is a key pest in apple, pear, crabapple, and Oriental pear trees. The adult codling moth is a small, brown and gray banded moth about 1⁄2 inch long (Figure 1). Difficult to scout for as these moths fly during dusk and dawn, but they can be monitored with traps baited with pheromone lures. After mating, one female moth lays dozens of flat, circular, 1/12-inch (or 1 mm) diameter eggs in a tree (Figure 2). 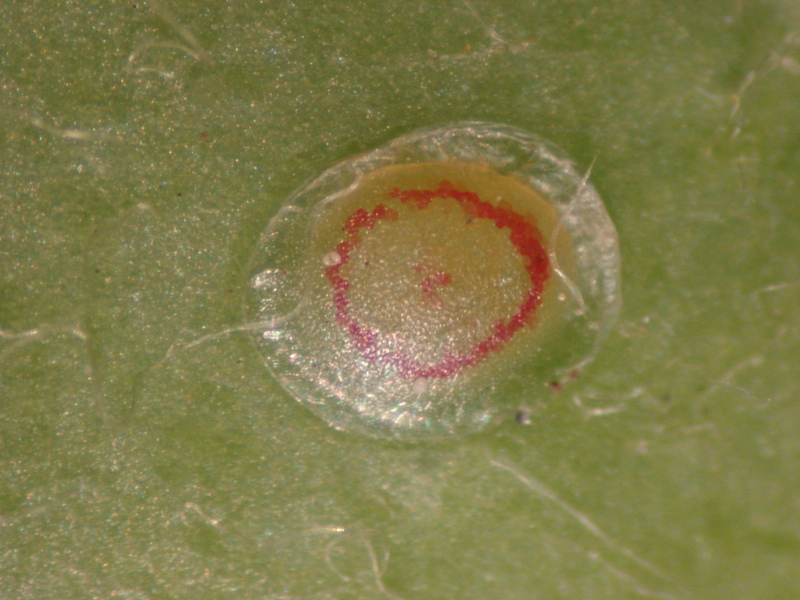 Again, it is difficult to scout for the eggs as they are tiny and often match the surface color of the apple. These eggs hatch into larvae or “worms” looking for fruit to bore into and call home. When they find such a fruit, the worms bore directly to the core of the fruit and feed about the seeds (Figure 3). 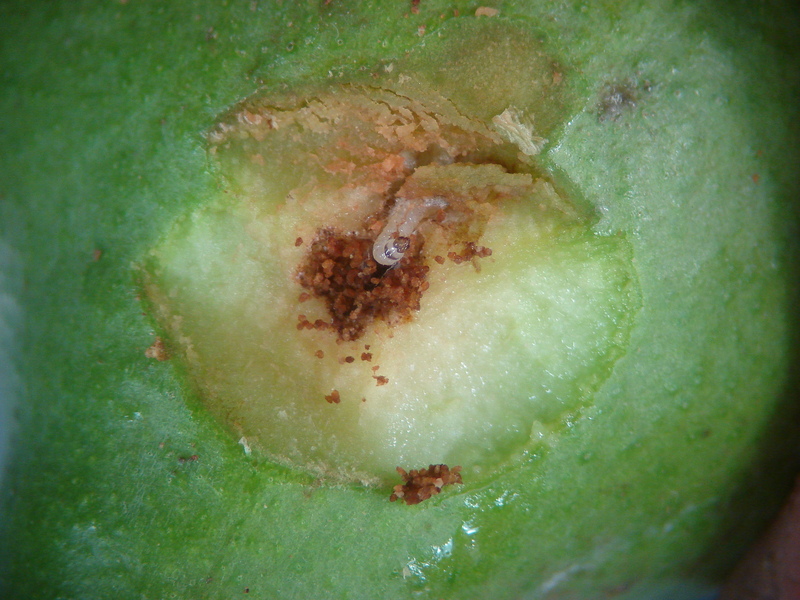 Their feeding activities result in conspicuous piles of brown, granular piles of excrement (frass) plugging the entrance hole on the surface of the fruit (Figure 4). While this is the easiest sign of codling moth to scout for, once larvae enter the fruit they can only be controlled by picking and disposing of the fruit. Mature worms can be up to 3/4 inch long caterpillars, and often have a pinkish cast. When mature, the worms leave and drop from the fruit to pupate in cocoons at the base of the tree. Often they pupate among the cracks and crevices of the tree bark, but they will pupate in any nook or cranny on wooden structures, posts, firewood piles, crates, and even furniture near the host tree. Washington homeowners must protect their apple/pear fruit from two, sometimes three in the warmer regions of the state, generations of codling moth each year. The adult moths fly during warm evenings with peak flight activity in May, July, and late August. The best means of protecting backyard fruit trees from codling moth attack is an integrated pest management (IPM) program utilizing several control strategies.